Lee's Boston Drum Builders Blog: Who was A. J. Oettinger? Who was A. J. Oettinger? In relation to the early 20th century drum makers of Boston, A. J. Oettinger was little more than a tangential figure. It does appear, however, that he was a very active participant in the musical instrument manufacturing and retail scene in Boston during the early 1900s, and a knowledgable one at that. Oettinger's name is referenced more than a dozen times in Christine Merrick Ayars' Contributions to the Art of Music in America by the Music Industries of Boston, 1640-1936. While most of Oettenger's expertise appears to have been outside the realm of percussion instruments, he did brush shoulders with several well known drum makers of the time including Elias Howe, Thompson & Odell, and Blair & Baldwin. Amongst Ayars' footnotes we see that it was Oettinger providing information to the author about "Grandsire Baldwin" who after leaving Blair & Baldwin went to work for John C. Haynes & Company. 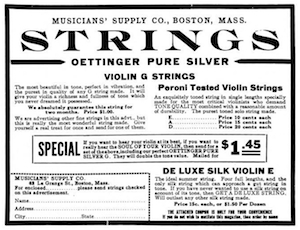 Ultimately, A. J. Oettinger was primarily known as a string instrument dealer, repairman, and provider of raw materials and parts to other makers. Earlier in her book, Ayars includes the following description of Oettinger's Musicians Supply Company which thrived for nearly 30 years until the owner's death in 1935. "Adolph Joseph Oettinger started work as a boy in W. H. Cundy's shop, was in business for himself for a year or two about 1884, and later worked for the Geo. W. Stratton Co., becoming associated with Elias Howe when that firm took over the Stratton Company from Howard C. Barnes. 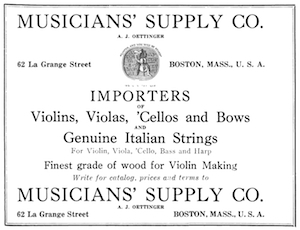 "The Musicians' Supply Company began in 1905 at 164 Tremont St. with the purchase of the stringed instrument and accessories business of Thompson & Odell. The firm consisted of Mr. Oettinger, Carl and Julius Nelson, the latter two being owners of The Vega Company. Mr. Oettinger later bought out the interest of the Nelsons. The company was located in 1920 at 218 Tremont Street, in 1925 at 83 Newbury Street, and finally at 177 Tremont Street. Mr. Oettinger died Dec. 10, 1935. As his sons had their own business interests elsewhere they did not care to carry on this concern, which is now being liquidated. "This company supplies raw materials, bows and tools for all kinds of bow-stringed instruments to makers located all over the United States and in foreign countries, such as Honolulu, South Africa, South America and the Walker Group of Islands. It is the largest dealer in the United States in wood and tools for these instruments. "The business includes also importing, selling and appraising old violins, violas and violoncellos, repairing all kinds of bow-stringed instruments and selling modern violins, bows and trimmings. "Oettinger Products" include their patented specialties such as a chin rest, a violin tailpiece, a violoncello tailpiece, a banjo tailpiece, a guitar tailpiece, tools, and the products which they sell to jobbers. "From its start the company has had expert violin makers making instruments to order as well as repairing them. For the last eight years Giuseppi (Joseph) Martino, an Italian who previously had his own shop at 181 Tremont St., has been with the company as violin maker and repairer."